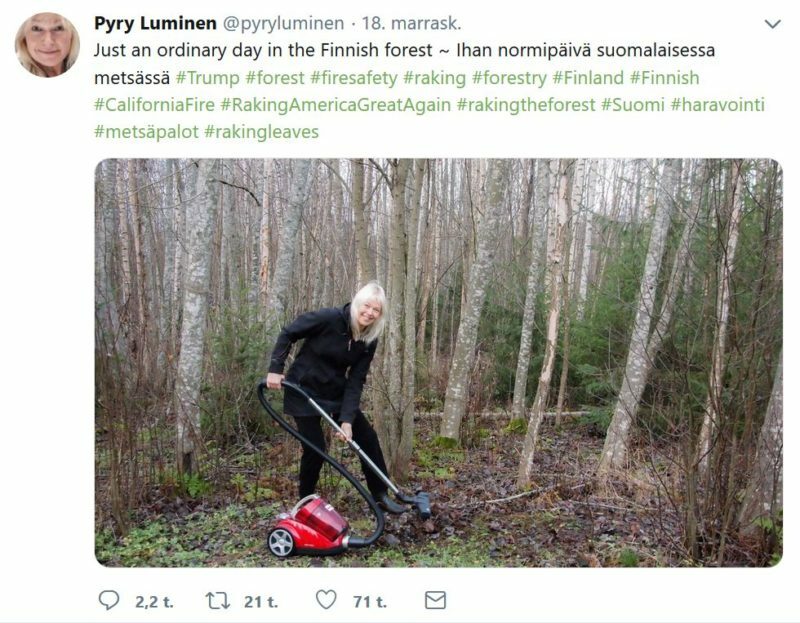 The widely noticed statement by Donald J. Trump, President of the United States, praising Finland’s skilled forestry has been overshadowed by his including the word “raking”. Finns have indeed invested greatly in forest fire prevention, but this does not mean that their experience could be useful under such different circumstances as those in California. The Finnish way to prevent forest fires starts from a responsible use of forests. “Although everyone can, thanks to everyman’s rights, move about in all Finnish forests, people are extremely responsible about making a fire,” says Markku Remes, Senior Expert of Forest Management at the Finnish Forest Centre. Everyman’s rights do not permit the lighting of a fire in a forest owned by somebody else. In practice, it is impossible to monitor whether or not this rule is observed in a country with four hectares of forest per capita. However, people are very careful about making a fire in the forest. Another cornerstone of fire prevention is the detection system. As soon as a dry period sets in, planes will start flying over Finnish forests looking for smoke and pockets of fire. Last summer, for example, was so dry that the funding for aerial detection was already used up by the early summer, but the patrolling was not cancelled. “The necessary funding will be found somewhere. Everybody understands that if the aerial patrolling is cancelled just when it is most needed, the risk of even bigger losses will increase,” says Remes. Still, it is an altogether different question whether fires can be prevented with the best of wills, if rainfall over the entire summer is below two centimetres, as was reported this summer by local press in some Californian localities. In Finland, the rainfall was as much as 20 times that, even though the summer was also dry here. Another difference is the nature of winds, which are strong, hot and dry in California. In Finland we have rarely seen similar winds. “It is fair to say that our climate is a good friend of the fire brigades,” says Remes. Once a fire starts, it will be restricted by the very dense network of forest roads, unless it has gained considerable strength. In addition to this, the forests are fragmented because of natural reasons. Rivers, lakes and mires break the forests into a mosaic where fires will not spread as easily as in unbroken forest. “The natural fragmentation is reinforced by the fact that the forest compartments where forestry operations are carried out are relatively small, averaging about 1.5 hectares in southern Finland,” says Remes. In northern America, areas where forestry operations are carried out simultaneously may be even hundreds of hectares in size. Forestry based on clearcutting may create an advantage in that young forest stands, at least, may not catch fire very easily. “At this stage, the amount of deadwood in the forest is small and in general, there is not that much to burn in the forest, so a rampant fire cannot really develop,” says Remes. Under different conditions, such as in a forest that has been logged selectively, a great deal of deadwood may be present and the risk for the fire spreading via tree canopies is high, as was also seen in California. In Finland, the cooperation between authorities and private stakeholders is seamless. The structure is in place in advance, so everyone knows what to do when a fire starts. For example, power companies are part of the network, so they can cut the supply to power lines in areas with fires. In addition, forest use may be temporarily restricted in many ways to prevent fires. The forest fire warning announcements are a routine during summers in Finland, and while they are in force, open fires are not allowed out of doors, not even so much as a burning match. Forestry operations may also be restricted, because a fire can start from sparks from the rollers or other parts of forestry machines. “There were such restrictions during last summer as well. Nevertheless, some 3,400 fires occurred, sometimes ignited by forestry machines as well,” says Remes. Fire prevention is considered important, and if required, the authorities are entitled to requisition any resources available, including private individuals. “If requested by the authorities, no one can refuse to take part in fire fighting, not to mention refusing the use of equipment necessary for fire prevention,” says Remes. “Luckily, there has been no need for such demands lately. 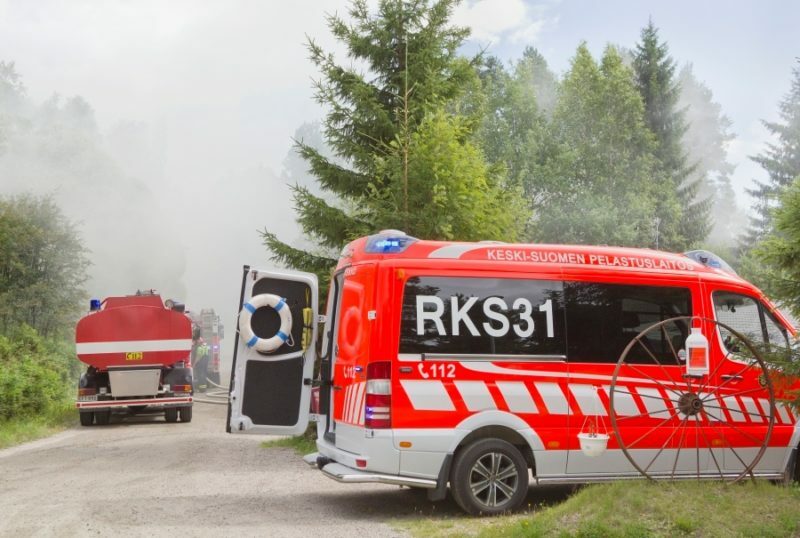 This is because the cornerstone of fire prevention are the voluntary fire brigades, which can be found in numerous localities all over Finland,” says Remes. The strongest reactions to President Trump’s statement were caused by his claim that forest fires are rare in Finland because the forest floor is raked clean of vegetable litter. This, however, is a misconception: rakes such as those used in gardening are not used in Finnish forests. Still, the verb “to rake” used by the President also has the meaning “to gather logging residue from the forest floor”, and this kind of activity is carried out in Finnish forests, and partially in order to decrease the amount of flammable biomass on the forest floor. It is not known which meaning was uppermost in President Trump’s mind. Though he made reference to his recent conversation with the President of Finland Sauli Niinistö, we do know from President Niinistö that these details did not come up during it. 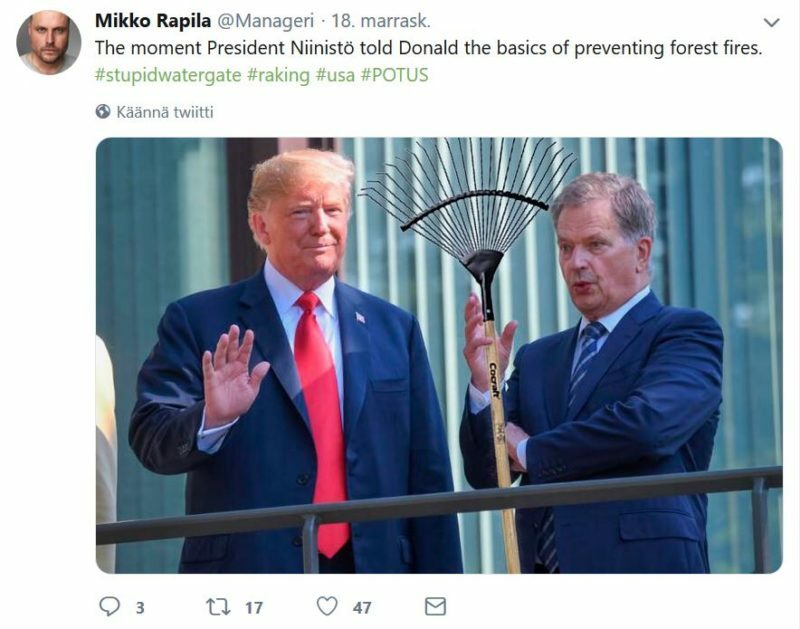 However, President Trump’s comment on raking was a source of much amusement in Finland. The news item, first published last Saturday, sent countless Finns to nearby forests during the weekend, carrying rakes or even vacuum cleaners, and scattering a litterfall of pictures of this new, very Finnish forest activity in the social media. Finland has plenty to offer when it comes to fire prevention. In fire suppression we have nothing to offer to California. The Finnish forests belong to a Fire Sensitive Ecology whilst the Californian ecology through human fire use (during the last 150 years) has been turned into a Fire Dependent Ecology. The Fire Dependent Ecology similar to the one in Sub-Saharan Africa, has changed the entire composition of plants to ones that are very flammable. Consequently therefore fire prevention activities like a man-made fuel break system is a must. Equally important is fire education to get people to understand when use of fire is totally prohibited. Changing the human behavior is of highest priority. Globally only five countries out of UN 234 countries and territories have been able to educate their human population: namely Germany, Finland, Thailand, Japan and New Zealand. Thanks for this good contribution. We surely agree on what you write about the need of education. But how to do it? Maybe the procedures are not the same in US than here, I presume. For the last 40 years we Finns (about 10 of us) have been educating people in more that 40 countries in how to change the behavior of people using fire daily (i.e. women doing cooking and agricultural clearing). Initially this was carried out through the Finnish National Board of Education and later through Pöyry, Stora Enso, UPM, ILO, FAO, IUCN/ITTO and UNDP. Through educating almost two million local farmers in Finnish fire projects in seven African countries we have reduced the annual burned area in Africa by 20 million hectares annually. Now, unlike California, local people in these countries possess the knowledge how to control fire. The Finnish Global Handbook MFA/FAO at fao.org, Wildland Fire Management; Handbook for trainers is now official for 234 countries and areas globally. The book has been translated from English to Arabic, Italian, Macedonian and Russian. The translation into Farsi will be printed in December, 2018. More than 30 million readers have read this handbook since its first print in 1993. So, we Finns do have a lot of knowledge that could be shared with the US forestry.